Searching for that perfect present for the cat lover or cat parent in your life? Look no further than the Tri-Coastal Design Cat Mug. 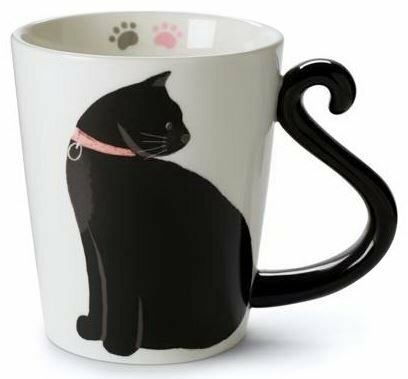 This adorable cup features a black and white kitty with pink collar delicately hand-painted on the side that flows into a black tail-shaped handle. Just inside the rim of the cup are black and pink paw prints that add a cute touch and flair to this dainty mug. What's even better than an adorable mug to celebrate you or a friend's love of cats? A mug for your coffee, tea or any other beverage that is BOTH microwave and dishwasher safe! If your drink needs a quick warm-up, you can pop this mug in the microwave and not be worried about it cracking or chipping. When you are finished drinking, simply place the cup in the top rack of your dishwasher and avoid wasting time hand washing it after every use. The Tri-Coastal Design Cat Mug is also the perfect size for whatever beverage you are drinking, whether hot or cold. Holding up to 11 ounces of liquid, the cup measures 3.3 inches wide by 4 inches tall. Great for any age, from kids to adults, this cat mug makes a perfect holiday, anniversary, birthday or "just because" present for any cat lover. Don't wait, grab your adorable cat mug today! If you have any questions about this product by Tri-coastal Design, contact us by completing and submitting the form below. If you are looking for a specif part number, please include it with your message.